For convenience, I'll refer to this genderless droid as "he." BB-8 has equipped in it the secret map to Luke Skywalker, so much of the movie is based around getting him to safety from the chase of the evil First Order. In doing so, BB is subject to the environments of a variety of different planets, from the deserts of Jakku to the lush forests of Takodana. Now that BB units are finally available to the people of Earth, on Star Wars day 2016 I set out to test the physics of my new droid and compare it to the real deal from the Star Wars universe. WIRED has a great article explaining the physics behind the toy, so I'll leave the explanation to them and get on with the demonstration. I wrongly assumed this would be an easy test, but our little BB unit struggled mightily. At around a tenth of the size of the real thing, pebbles and twigs become akin to boulders and logs. There's not enough room to swing it's center of mass over obstacles. I was skeptical of this one from the beginning, but BB had no traction whatsoever in sand. He immediately buried himself deep enough to become immobile, and when he did move he just spun in place. His spherical body was too smooth to grip the grains of sand. In the movie, BB slowly and deliberately navigates each step. Spotting his landing, inching forward to fall, then halting his momentum to repeat the process for the next step. I understand it's not fair to subject a much smaller scale version to a similar staircase, but I also don't have a dollhouse in my office. Robots continue to hate stairs. Poe Dameron's X-wing can grab BB-8's head from above and pull him into position as co-pilot. Our BB-8's head is stuck to his body via a small refrigerator magnet. Upon careful analysis of these videos, it is my determination I have purchased a knockoff ball droid. 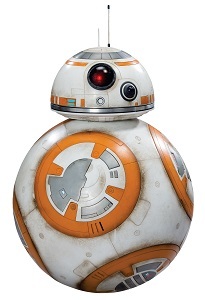 My BB-8 doesn't have the size, weight, external friction, or link to it's head required to navigate most terrain. While we have bonded in true friendship, any adventures we have together must be confined to hardwood floors or low pile carpets. Happy Star Wars day!